Ruth Soukup's new book Living Well Spending Less is one of those that I had noticed a little buzz about online. The title seems to relate to a season that I'm in right now so I was interested in seeing what the book was all about. 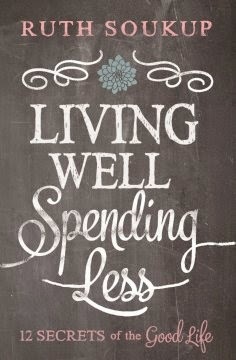 Living Well Spending Less is divided into two parts: Living Well and Spending Less. Ruth Soukup shares her personal experiences and lessons learned through her '12 Secrets of the Good Life'. The book is easy to read and as a wife and mother, I can definitely relate to some of her experiences. Spending isn't really something I struggle with, but I still appreciated that the book seemed to encourage and reinforce those good practices. The money saving tips mentioned in the book are all things I've heard before, but it was nice to be reminded of some of them. The Living Well part of the book was probably my favorite of the two. Secret #6 : Less Stuff Equals More Joy is a focus of our family right now and I enjoyed reading how Ruth Soukup applied that to her own life and family. I appreciated that the book references the Bible and shares scripture relating to the 'secrets' Ruth Soukup shares. Overall, I enjoyed this book and would recommend it to someone who is looking for ways to save money or find more joy in life.